When the going gets tough, the tough get going; cycling is a sport that prides itself on suffering, toughness and overcoming adversity. The riders at Round 2 of the Odd Down Winter Series did cycling proud as another day of stormy weather ripped across the circuit and the riders fought back with a display of aggressive and fierce racing that left no doubt that bike racers live up to the memes and inspirational quotes that surround us as cyclists. Louise Hart (Performance Cycles) had gone straight for the jugular in the women’s 2/3 race last week, taking the solo win and the Road.cc Combativity Award, and looked to repeat the trick again from the gun. Whilst her coattails slipped through her rivals’ fingers last week, Lauren Johnston (Avid Sport) has plenty of experience going toe to toe in fights at the front of races at Odd Down and was not giving Hart an inch of space. As the pair powered away from Nicole Coates (Performance Cycles) and Becky Evans (PDQ Cycle Coaching) it seemed to be only a matter of time before the ceasefire was called off. After parking Johnston on the front for a full lap, Hart threw a Haymaker into the toughest crosswind section and prised open a gap of five bike lengths. Johnston looked to be clinging on by her fingernails, but fingernails were enough and the pair were reunited. It was undeniably Hart on the offensive with her companion parrying the attacks and as the finish neared Johnston’s efforts showed as she did not have enough to come around Hart in the sprint allowing the series leader to take a deserved victory. Evans took the sprint for third behind the leading pair, further solidifying her position as leading third cat. Hart’s win gives her a commanding 55 point lead at the top of the second cat standings ahead of Johnston and Lucy Gadd (Liv Halo CC). In the men’s 2/3 race, the promise of a combativity prize sent University of Bath CC’s Daniel Martin off on an early solo escape. 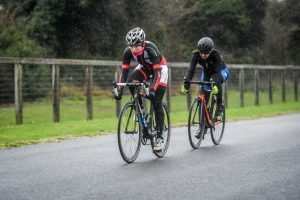 Martin was a credible threat though as a strong time trialist and leading third cat overall and when riders who featured in last week’s successful break started bridging across the move went from speculative to decisive. First Oliver Beresford (VC Venta) and then Will Page (Primera-TeamJobs) blasted across to the leader with Joe Peatson (Bikestrong-KTM) just about latching on and Andrew White (Okehampton CC) just missing out as the gap quickly ballooned to 30 seconds. In following the acceleration of the four riders up front, the chasing group itself was cut down to just five riders with the rest of the pack already well out of contention in the early going. Beresford and Page had been caught out by a late attack from Latchem Sunwise’s Adrian Lawson in Round 1 and the VC Venta rider was not waiting around for the same to happen again, charging away in the final three laps. His lead hung in the balance as he fought the wind alone whilst his former companions collaborated but as the final lap began it was clear that his gap would be enough. Page followed in for second with Martin in third. The win means that Beresford takes the series lead ahead of Page, with Peatson now in third and puts the previous series leader Lawson down into joint 4th place. The women’s 4th cat race was decided by a reduced bunch sprint last week and the race seemed to be going the same way again as the race entered its closing stages. However, last week’s protagonist Joanna Goodhead (Avid Sport) was keeping her powder dry this time around and lit the touchpaper with a lap and a half to go. This instantly split the group, with three riders muscling their way off the front of the pack. 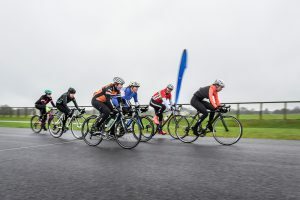 Rosie Lyon-Smith (University of Bristol) and Nicola Le Brocq (URDT) were glued to Goodhead’s wheel from the moment she lifted the pace, so when she launched early with the wind at her back Lyon-Smith was in prime position to pip her by half a wheel by the line. Le Brocq was unable to get back on terms so had to settle for third. Despite being denied the win for a second week, Goodhead can take comfort in assuming the series lead with a large 20 point margin. 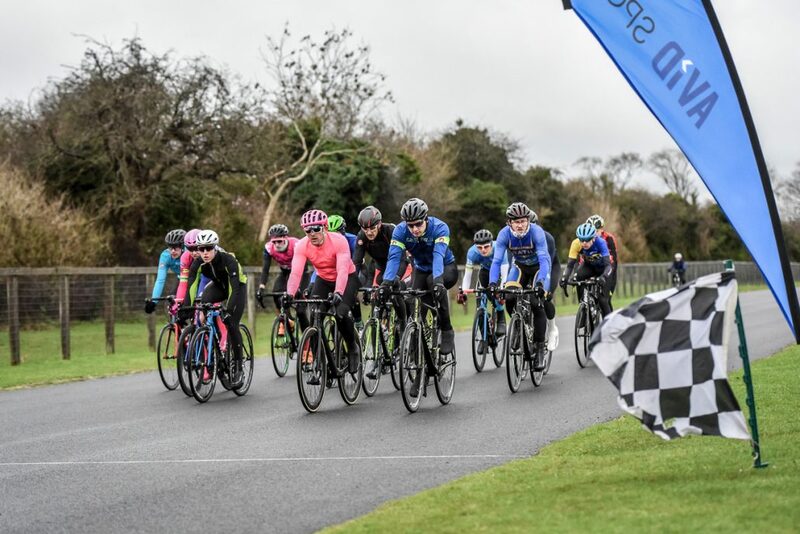 Michael Beech (University of Bath CC) had waited until the final laps to launch his ferocious race-winning attack last week but when Edward Rees (Ely RC) threw down the gauntlet with an early attack Beech weighed up his options before deciding to go all in early. He blasted past Rees and set off on an impressive individual battle with the wind. Mother nature, not to mention the rest of the field, didn’t stand a chance as Beech tore through lap after lap for over half and hour, seemingly the only one unaffected by the wind in his face. Rees, despite being left in Beech’s wake, was also building a handsome lead on the chasing group, which had been shrunk to six riders under the impetus of the pursuit. Conor McGoldrick (University of Bath CC) took the bunch sprint for third, matching his result from Round 1. He is now Beech’s closest overall challenger in the 4th cat overall standings along with Rees, although the pair are now 20 points behind.